There was a time when maximum numbers of mobile phone users just only know few names of mobile brands like Nokia, Samsung, LG and Motorola. But with the advent in the technology, the names like HTC are discovered and in a very short period of time, made it’s well-known reputation in the communication world of hi-tech gadgets. There is no doubt in saying that HTC mobile phones are one of the best phones available with hi-end features and all extra multimedia goodies. Whether its your music feature or camera quality, latest HTC mobile phones are just loaded with all sorts of music compatibility and camera functions. Being living in the advanced world of internet technology, so it is very important to use a fast internet running mobile phone. For all internet thirsty users, HTC mobile phones come with the support of 2G and 3G, allowing you to stay connected with friends all the time. But still, the users can may be worried about the price of this big gadget; it is true that, HTC phones are not easily affordable device. For those budget users, the deals like cheap HTC mobile phones contract may be the good option to opt. Founded in 1997 in Taiwan, HTC is now of the leading PDA and Pocket PC makers in the entire world. HTC is the first mobile phone maker to have launched first color palm-size PC, first Microsoft wireless Pocket PC, First Microsoft powered smartphone, first Microsoft 3G phone and end numbers of devices. HTC has partnerships with some of the biggest names in the software and mobile telephony industry like Microsoft, Intel, Texas Instruments, Qualcomm, O2, T-Mobile, Vodafone, Verizon, NTT DoCoMo, Sprint and Cingular. Therefore, HTC has always exceeded customers' expectation in the wireless segment. All ranges of HTC phones are now available on our site. Latest HTC phones are endowed with numerous business, web and entertainment features. Be it the HTC Magic or HTC Touch Diamond2 or the HTC P-Series devices, you will surely get an experience of a lifetime by getting any of these HTC mobile phones. Ours is a very easy and customer-friendly online platform, where you can also buy cheap HTC phones in just a minute. 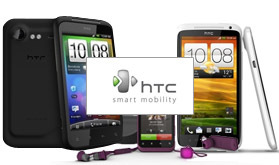 We also boast of offering you attractive free gifts and goodies with our HTC contract mobile phones.